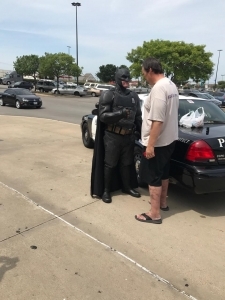 FORT WORTH (WBAP/KLIF News) – A man trying to shoplift some DVD’s from a Fort Worth Wal-Mart was caught in the act by none other than…Batman. Fort Worth Police Officer Damon Cole is known nationwide for dressing up as superheroes to show children that the police are the good guys. The kids at the store on Saturday saw just that, when Cole, still dressed as the caped crusader while attending a neighborhood safety fair, caught a man who allegedly stole four DVD’s. “One of the movies he was trying to steal was Lego Batman and I love Lego Batman. So, I walked up to him and was like ‘you can’t steal my movie…come on now,” Cole said. Relying on his super-hero strength, Cole decided to approach the suspect even though he wasn’t wearing tactical police gear. “I didn’t have my intermediate weapons on me. So if stuff would have gone south, it could have gotten ugly pretty quickly but…I am Batman…so, I ain’t going to let that happen,” he said. The value of the movies was less than $100. So, all the man received was a citation and, at his request, a selfie with the Officer Cole. Cole said his message to kids was even stronger that day because they got to watch Batman catch a criminal.